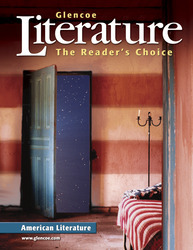 Literature: The Reader's Choice is the first research-based high school language arts program to combine outstanding literature with innovative active learning designed to bring students to a new level of REAL Success! An inquiry-based "Big Ideas" approach organizes, motivates, and guides students' learning, while innovative color-coded highlighting pairs text passages with questions to prompt students to read actively. Key reading skills and key literary elements introduced, practiced, and assessed with every selection help students read, analyze, and comprehend a wide variety of texts, including nonfiction. Teachers can differentiate, remediate, and accelerate with one book that will bring every student in the classroom into the community of learners! - Index of Authors and Titles. Please upload in Fileserve/Filesonic, the RS links are dead. Last edited by englishcology; 08-24-2014 at 08:34 PM. Would it be possible to have this book re-uploaded? Last edited by englishcology; 08-24-2014 at 08:37 PM. Last edited by englishcology; 09-14-2014 at 09:16 PM.